One of PSX’s biggest surprises was that PaRappa the Rapper was coming to PlayStation 4. No, it wasn’t in an all-new adventure, but the original PS1 game (which came out in 1996 in Japan and 1997 in North America) is getting a remastered version. Appropriately called PaRappa the Rapper Remastered the game features all of the original songs and now brings the beloved title to 4K televisions. The build I got to play featured the game’s first level, which takes place in Chop Chop Master Onion’s dojo. It has PaRappa learning martial arts in order to become a hero and impress the girl-flower person of his dreams, Sunny Funny. 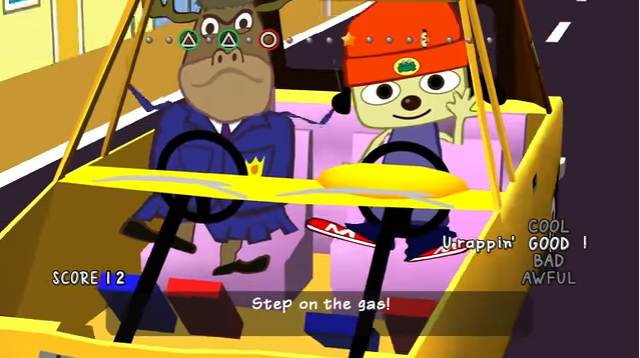 The gameplay hasn’t been touched, and players still have to time button presses in tune with the song in order to rap along with it. The pioneering rhythm game feels a bit simple by today’s standards, but I still had fun with the song and even managed to squeak out a cool rating despite being pretty rusty at it. PaRappa the Rapper Remastered is a faithful port, but it also comes with some new features such as the DualShock 4 being able to provide a metronome. I wasn’t able to check this out since I was wearing headphones to play the game (which honestly is the only way to play PaRappa the Rapper). It’s a really smart addition, though, as it’s a solid way to help out players that are having difficulty passing the levels. Graphically the game looks really phenomenal. I’ve never seen PaRappa and Chop Chop Master Onion look this good, and the art style has really held up well over the years. It’s really a testament that unique art styles will always hold up better than a game trying to be realistic, and PaRappa looks just as funky today as it did in 1996. The scenes are also now presented in widescreen, which gives the player a larger look at the environment, and the colors really pop on a 4K display. While the gameplay looks awesome, the same can’t be said for the rest of the package. Hands-down the biggest disappointment is that the game’s cut-scenes, which is where so much of the charm comes from, have not been updated. Instead, players have to watch the same footage that they saw on PS1, which looks terrible on a modern television. It also takes up a small portion of the screen, with the rest of it being filled by letterboxing. Hopefully the finished product will feature completely redone cinematics. Sure, it’ll obviously add to the development costs, but if you’re going to celebrate PaRappa‘s 20th anniversary then you should either do it right or not at all. It will really be telling whether or not the game gets the proper treatment, and it’ll be a shame if Sony doesn’t feel like the franchise deserves it. The other big worry I have about PaRappa the Rapper Remastered is that it’ll suffer the same fate as the PSP port of the game. When the rhythm game was re-released in 2007 it suffered from being very short, and only offering six stages. They tried to add remixes to lengthen the title, but it was still a hard sell when the game can be completed in less than two hours. This all could’ve been avoided if its sequels – PaRappa the Rapper 2 and Um Jammer Lammy – were included, but that doesn’t seem to be the case. At this point it’ll all come down to price-point and what kind of bonuses they throw in. If there are documentaries or some sort of new modes to play around in, it’ll definitely be able to please fans, even if the series might not have the staying power it had in 1997. Either way, I’m very glad that PaRappa’s debut adventure is coming to PlayStation 4 (where you can also purchase the PS2-version of the sequel). If it does well, it could lead to a brand-new game in the series, and that would definitely be the best case scenario. It’s a lot easier to sell a new product, than something fans have already paid for several times already.